The village’s railway station opened in the 1860s and passenger trains ran across the region for a century before eventually falling victim to the infamous Beeching cuts. Maud was a busy station with trains carrying whitefish and herring from Fraserburgh and Peterhead regularly passing through. 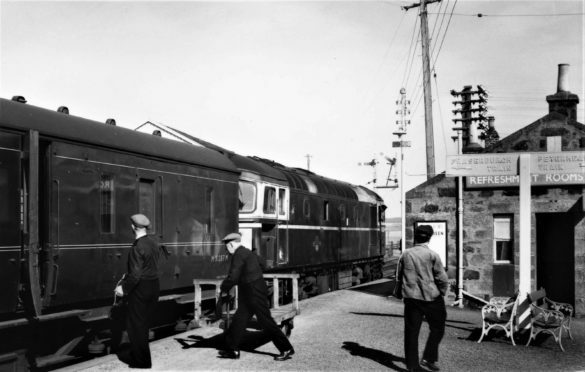 The final goods train from Fraserburgh called there 40 years. Aberdeenshire Council opened it as a museum in 2000 and still own the collection of posters, signs, photographs and other railway memorabilia. The volunteers at the attraction have been busy preparing for their first opening weekend of the year. Des Byrne from the Friends of Maud Railway Museum, the charity which runs it on behalf of the council, said they want to give people a glimpse of its past. He said: “This year, we are expanding the whole site to become an open air museum. “People can have a look at what is left of the buildings and the structures that once made up the set up at Maud. “It was quite impressive really and we’ve been working on the restoration of the water tower this year. “We’ve had all the foliage cleared from it and we’ve put a new door on it. Mr Byrne said there will also be a railway turntable, air raid shelters and bothies for people to see as well. One of the most fascinating artefacts going on display this season is an old carriage which was used to transport inmates from Peterhead Prison. The wagon has been fully restored after being used as a chicken coop. It was one of the five original carriages deployed to take inmates to the nearby Stirlinghill quarry. The first Maud Railway Museum open weekend of 2019 will be held on Saturday, April, 13 and Sunday, April, 14 between 10.30am and 4pm.